People who know me know I’m not a DIY fan. It’s empowering to do something yourself. There is a satisfying sense of accomplishment that comes with the successful completion of a project. I also love cutting costs by doing things on my own, and often learn new skills in the process. But even an avid DIY fan like me knows that there are some things that I simply can’t do by myself. I also know the value of working with a professional. Some of them are obvious. Like open-heart surgery or building an aircraft. But others aren’t so straightforward, like legal documents. Even as an experienced BC Notary, I know there are certain legal documents that I can’t prepare on my own. I accept that and defer to other experts when I need these documents. This is why I’m concerned about a growing trend: people wanting to DIY their Wills (often using the internet as their only source of information). Don’t get me wrong, I understand the appeal: cutting costs, avoiding the hassle of having to see a professional, the satisfaction of learning a new skill. These reasons are valid, but trust me when I say, it’s just not worth it. In the best of cases, DIY Wills are often ineffective, and seriously hinder the chances that your wishes are followed. In the worst of cases, they are deemed invalid by the courts and leave your loved ones scrambling to figure out what to do with your estate. In B.C. and in many other jurisdictions across Canada and the United States, certain formal elements must be in place in order for a will to be valid. If the procedures aren’t followed correctly, then the whole will is deemed invalid. There are legalities to consider, and you’ll need to make some difficult decisions about the future of your estate. It’s advisable to have an expert that can help you understand the legal consequences of your decisions. Executors play a central role in the administration of a will. Without good executors, the final division of your estate can cause huge headaches to everyone involved. Guardians take care of our Children should we not be there. Should they be the same person? Do you know why it’s good for them to be different people? Have you thought about checks and balances? 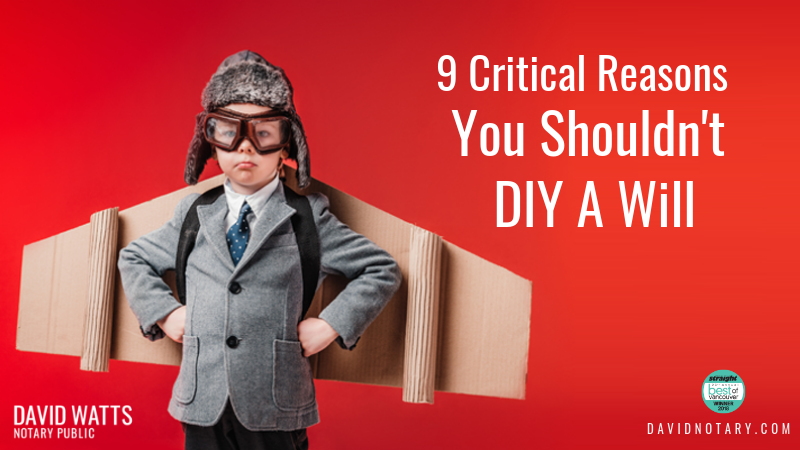 DIY-ing your Will may lead you to make bad or inappropriate choices about executors and guardians. 3. How Much Do You Know About Taxes Anyway? 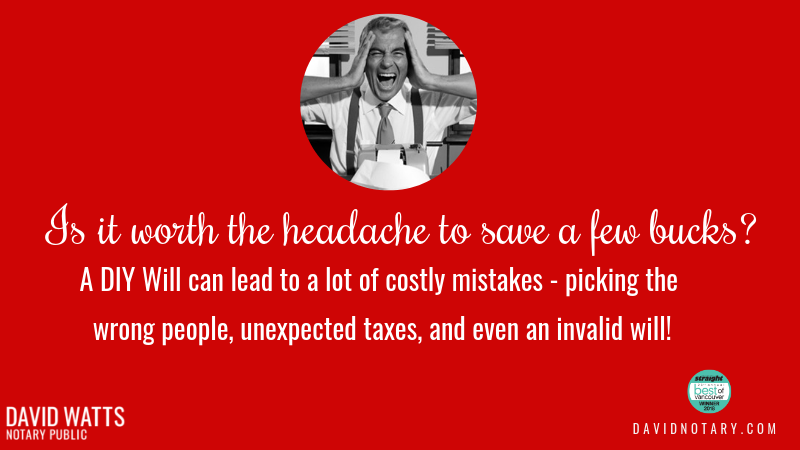 Many people forget that taxation plays a central role in estate planning and wills drafting. When a BC Notary drafts a will, they can tell you what type of taxes a person will have to pay in estate and transfer taxes, giving you the information to adequately divide your estate. Without understanding how taxes work and what role they plan in estate transfers, there’s a chance you may be burdening your loved ones with heavy taxes. In general, DIY legal service providers create one will template, but not everybody’s situation is the same. BC Notaries create a will to meet your estate needs, personalizing your will so that it is both valid and effective. Whenever you write a Will with the assistance of a legal professional, you are walked through a series of questions that help you account for the totality of your estate. Only once your estate is properly assessed, will a Will be drafted to divide your estate as you see fit. DIY-ing you Will may cause your assets to be divided differently then you wished because they are not properly accounted for. The whole point of making a Will in the first place is to decide what you want to do with your estate. Whether it’s big or small, your estate comprises of the fortune that you were able to build over your lifetime. DIY legal service sites can make it sounds like creating a Will is simple. But it isn’t. And mistakes cost money. In fact, ineffective wills can end up costing your family thousands of dollars in legal fees down the road. That can mean that your fortune — big or small — can end up going to covering those fees rather than to your loved ones. No matter how much research you do, you probably don’t speak legalize, (which is how I call the oh-so-complicated language of the law). So even though you (and other normal humans) think that your Will is clear, without proper training, there’s a good chance that your wishes may not be clear for the law. If this happens a court case is required to determine the correct meaning of the Will, costing your family their precious money and time. 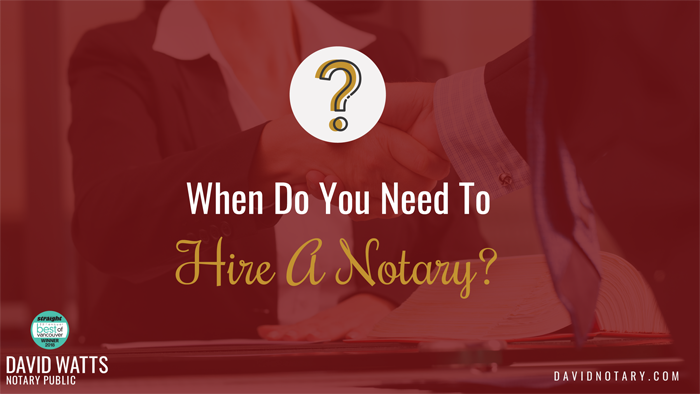 One of the big benefits of working with a BC Notary is that you get to discuss your estate plan, ask questions, and get advice about the best way to structure things. Our experience makes the process much easier to work through. Common feedback we hear is that “that was much easier than I expected”. We also hear that “I feel like a heavy load has been lifted from me”. Let us do the heavy lifting. You’ll feel better having these important details sorted out. 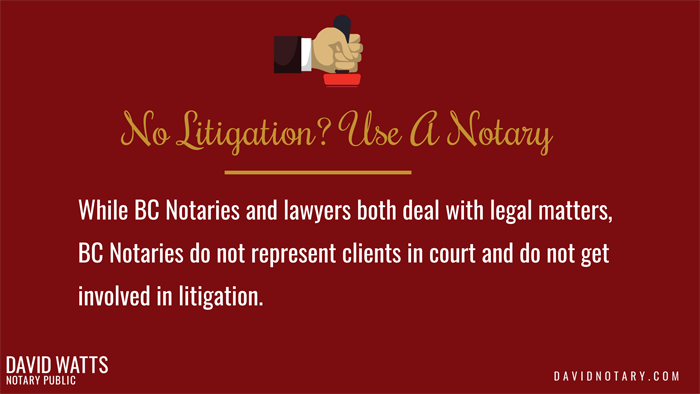 BC Notaries can help with Wills, but we also prepare and advise on Powers of Attorney and Representation Agreements. For a complete estate plan and to provide full protection; it’s important to discuss if a Power of Attorney and/or Representation Agreement is something you can consider and learn about when working with a professional as opposed to a DIY wills kit. At David Watts, Notary Public, we can help you write your Will. We have more than a decade of experience helping people with their estate planning and can give you the advice you need to write a valid and effective Will. Get in touch and we’ll make sure your Will reflects your wishes.